Happy 4th of July! What’s everyone up to today? We are going out to celebrate a friends birthday (Happy Birthday Andrew!!) at a new Brazilian Steakhouse, here in Columbus. I’m pretty excited to check this restaurant out, I’ve never been to a Brazilian Steakhouse before. From what I hear, I need to be ready to chow down. In other news, I passed boards part I! Oh my goodness, what a relief. Thank you to everyone who supported and believed in me 🙂 It was a rough road! I think little Leo was my lucky charm. 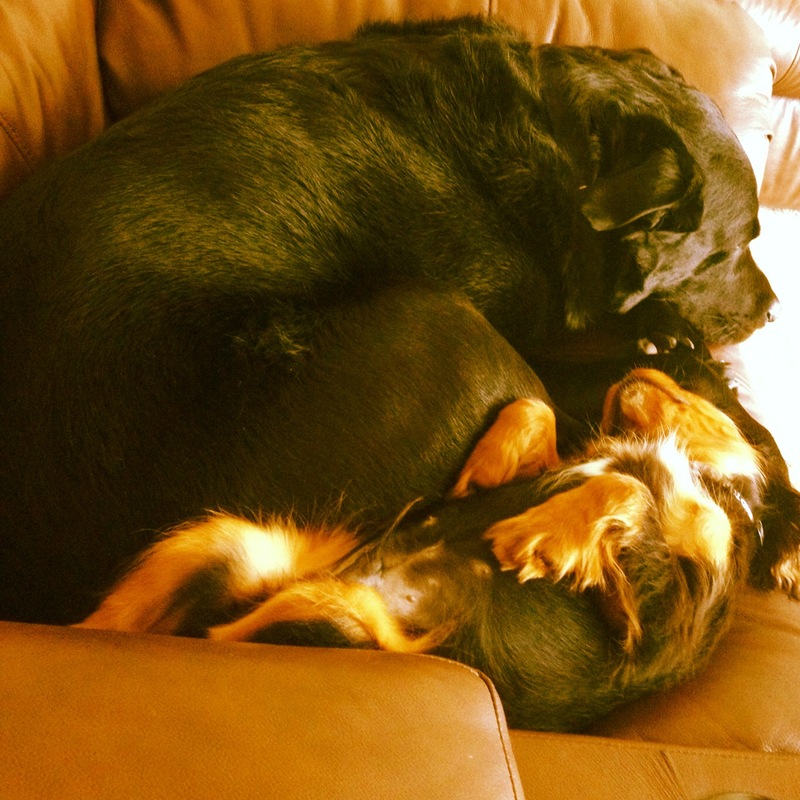 Check out Leo and Diesel napping together, so cute right? 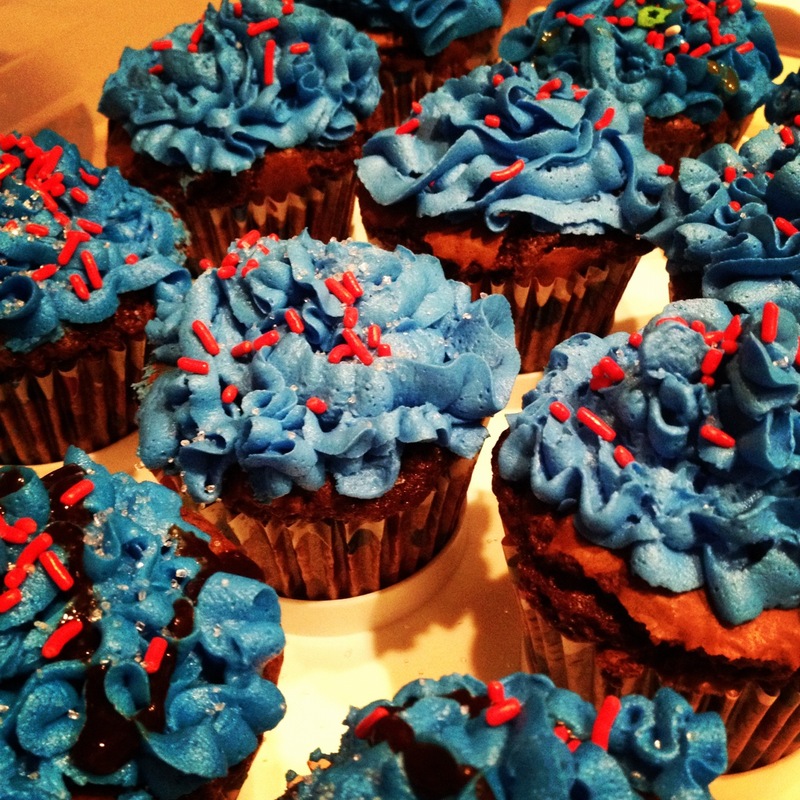 I made these cupcakes for Andrews birthday and he told me to dye the icing blue, so I went full force patriotic! Two birds, with one stone. This is a great recipe, they turned out so delicious. I topped the cupcakes with a buttercream frosting and add a chocolate/caramel drizzle to half of them, just to switch it up a little. 2. In pot, melt butter and two types of chocolate tougher. Stir until smooth and lump free! Remove from heat and whisk both types of sugars in to chocolate mixture. Add eggs one at a time. Blend in vanilla, flour, and salt. 3. Line 10 muffin pans and divide batter in to muffin tins. Place in oven for 20-25 minutes, until toothpick comes out clean. Remove from wire rack and allow to cool completely. 1. With an electric mixer, soften shortening. Add vanilla, butter flavoring, water (or milk), and merengue powder. Mix well. 3. 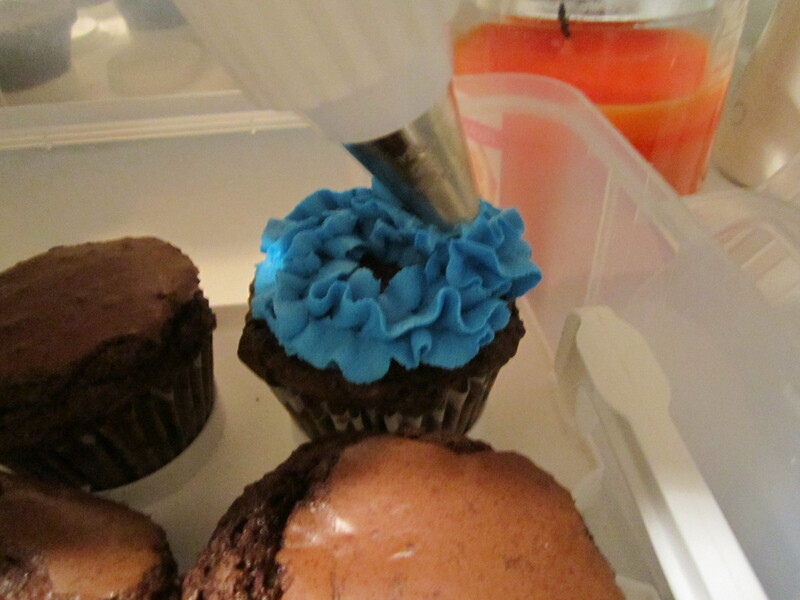 Once cupcakes are completely cool, its time for the best part – decorating! Decorate as you wish 🙂 I added blue dye to the icing and used a piping bag to decorate the cupcakes.